The varied landscape and incredible variety of flora make Durlston a magnet for butterflies throughout the spring, summer and early autumn. 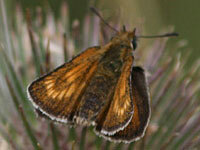 The nationally rare Lulworth Skipper occurs widely around Durlston. This rather insignificant skipper seldom moves far from its food plant, clumps of coarse Tor Grass. On sunny days in July and August it is easy to find, the rough grass of the south-facing slopes overlooking the sea being particularly favoured. However, in inclement weather, the insect drops down deep into the grass. The Lulworth Skipper seems to be extending its range, as more areas are being invaded by coarse grasses, but apparently it seldom occurs outside Dorset. Large Skippers (in June) and Small Skippers (in July) can be very common in the meadows. Essex Skippers and Grizzled Skippers are less common, preferring the south-facing gullies. Dingy Skippers are widespread, but never common, in May. 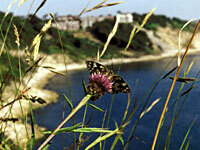 The location of Durlston makes it ideal for a ‘landing’ of migrant species. It seems that Red Admirals, common in most years, now breed widely in the area. Their numbers are augmented by others reaching Durlston in the spring. Some years see a marked influx of Painted Ladies and Clouded Yellows. They are known to mass at Durlston before spreading out further inland. A glance over the wall of the coast path will often be rewarded by a glimpse of a migrant. 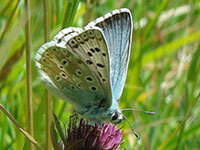 Many visitors are attracted to Durlston in the hope of seeing an Adonis Blue. This nationally scarce butterfly is on the wing in May and again in August and September, the radiant turquoise blue of the male’s upper wings making a striking picture. It is often abundant on the south-facing slopes of the Downland, where it is attracted by its food plant, the Horseshoe Vetch, but it is seldom seen in the meadows. 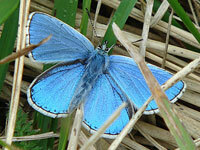 Numbers of the Adonis Blue seem to have increased in recent warm, dry summers. However, for no obvious reason, Chalkhill Blues have declined in numbers over most of Southern Dorset. They are now seen only in small numbers at Durlston. Common Blues can be seen in all parts of the park, virtually throughout the summer, being particularly abundant in the meadows. Here, colonies of Small Blues occur, associated closely with patches of Kidney Vetch, the food plant of their larvae. As elsewhere in the country, numbers of Holly Blues fluctuate widely from year to year. 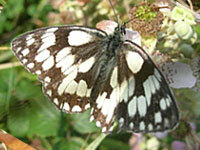 They are usually to be found in good numbers in the wooded areas around Durlston Castle in April and again in August. There have been increased sightings of Purple Hairstreaks in the vicinity of the ‘Castle’. Although normally only associated with the (deciduous) English Oak, they seem to be breeding on the (evergreen) Holm Oak at Durlston. Their close relative, the well-camouflaged Green Hairstreak, may be disturbed in small colonies throughout the park, usually where there is hawthorn or bramble. 'Clouds' of Marbled Whites rising from the flower meadows in July is a highlight of the Durlston Year. This elegant and striking black and white butterfly abounds, and is joined by numerous Meadow Browns, Small Heaths, Common Blues and Gatekeepers, together with the occasional Brown Argus Blue. An increasing number of Dark Green Fritillaries may be seen speeding over the open ground of the meadows. 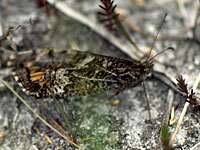 Lucky walkers along the Coast Path in July may put up the ‘Master of Camouflage’, the Grayling. It can be confused with the smaller and more common Wall Brown, which is likely to be found in this area. They are often to be seen on the wall of Tilly Whim Cave in May and again in August, with a later flight in September in some years. The nettle beds, valerian and buddleia bushes near the ‘Castle’ attract Small Tortoiseshells, Red Admirals, Peacocks and Commas. The wooded coastal path between the ‘Castle’ and the lower entrance to the park (off Durlston Road) is likely to yield several Speckled Woods. Together with the Red Admiral, the Speckled Wood is the only butterfly that can be seen in every month between March and the end of October. The “Aviary”, near the lower entrance , is a true ‘woodland glade’, frequented by Green-veined Whites in May and again in August. Orange Tips and Brimstones may be seen here in spring, with the occasional Silver-washed Fritillary and Comma in late summer. Two Butterfly Transects Surveys are carried out each week during the summer. The results of these are available in the Information Centre. They give information on which of the 34 species seen at Durlston are on the wing, and where they are most likely to be found. These surveys are part of a national scheme, organised by ‘Butterfly Conservation’, to record butterfly patterns.